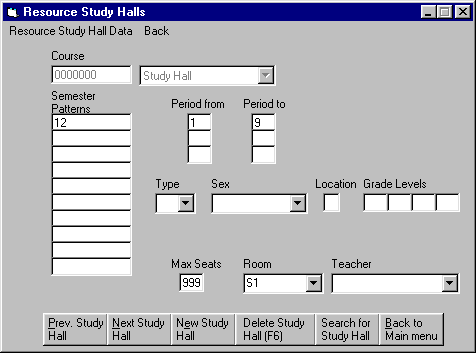 This is the Resource Study Halls screen of Solstar 2001. For a description of the buttons please scroll down. What are Resource Study Halls good for? You need the resource study halls, if you want to create a schedule using the Master Schedule Generator. : You browse to the previous resource study hall. : You browse to the next resource study hall. : You can enter the data of a new resource study hall. : Clicking on that button deletes the current resource study hall. : Opens the search study hall window where you can select a resource study hall by double-click.